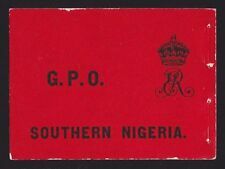 Nigeria 1953-1958 Queen E.II 11v Used Stamp. King George VI short set to 1sh mint. With lightly toned and cracked gum. Lightly mounted mint. Year : 1936. JUMP TO ITEM PHOTOS. Reign : King George V. Catalogue No : 34 to 41. Condition : Lightly Mounted Mint. Nigeria 1936 short set to 10s SG34/44 MM - a few with crazed gum. MLH/MM (etc) - a mix of MLH and MM with the majority being MLH. MLH - Mint Light Hinged - lightly hinged no hinge remainders. Get images that. 1936 ½d to £1 KGV Definitives set of 12, mint hinged – no thins, tears or bends. Southern Nigeria 1901 QV 10s black & purple/yellow MLH. SG 9. Sc 9. Southern Nigeria 1901 QV 10s black & purple/yellow mint lightly hinged. Gibbons # 9. Scott # 9. Region Nigeria. Country/Region of Manufacture Nigeria. Grade F/VF (Fine/Very Fine). PO Box 6091 Lincoln, NE. I have been a collector since 1950. I have been a dealer since 1998. A mounted mint example Sg 29a. SOUTHERN NIGERIA-1906 2/6 Grey-Black & Brown. UK RECORDED (UPTO £100 TOTAL) £2.00. Nigeria 1941 King GVI multi frank CENSOR cover to USA with 2c.Postage Due stamp. Wmk Crown CA. A lovely item. Very nice Mint & Used collection with many Better values. Doing that is against U.S. and international laws. 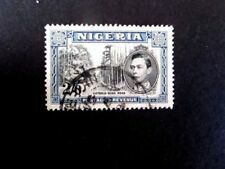 Nigeria George VI law values varieties mostly MNH condition. Lydda Airport. sent to Palestine. DO NOT DUPLICATE OR COPY! Lagos 1s yellow-green S/G (38a) 1887/1902 "Exclamation Mark for "I" (See Gibraltar for reference). Very Lightly Mounted Mint - Collectors Mark - As seen. A lightly mounted mint example Sg 29a. 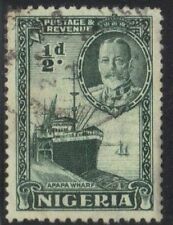 SOUTHERN NIGERIA-1906 286 Grey-Black & Brown (chalk surfaced paper) HEAD DIE A. UK 2ND CLASS (UPTO £40 TOTAL) FREE. UK RECORDED (UPTO £100 TOTAL) £2.00. MLH/MM (etc) - a mix of MLH and MM with the majority being MLH. MLH - Mint Light Hinged - lightly hinged no hinge remainders. VFU - Very Fine Used. FU - Fine Used. make Supersized seem small. Used - used and in a good collectable condition. Small dealers mark on reverse. Very fresh. Add to Favourites. SG#66 | 1/2d | Cat £1.5. SG#67 | 1d | Cat £1.5. SG#68 | 2d | Cat £2. SG#69 | 2 1/2d | Cat £2.5. SG#70 | 5d | Cat £90. SG#69a | 2 1/2d | Cat £3. SG#72 | 1s | Cat £29 (with minor defect). Lagos Collection of used between SG 10 & SG 61. (SG Cat - £219). MH & UNUSED ONE NO GUM.